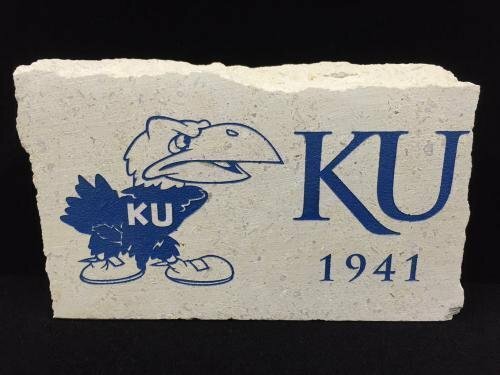 A large Selection of unique University of Kansas Officially Licensed Jayhawk Merchandise and Memorabilia. Among the many products you will find are Gift Items, License Plates, Car Emblems, Keychains andGlassware. 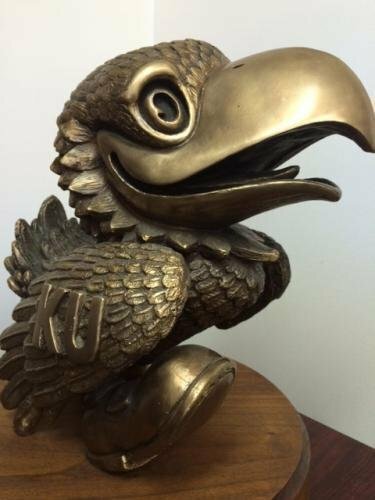 Included in these is our signature Pewter Jayhawk figurine. Many of thee items are only available through our store, as we are the manufacturer. 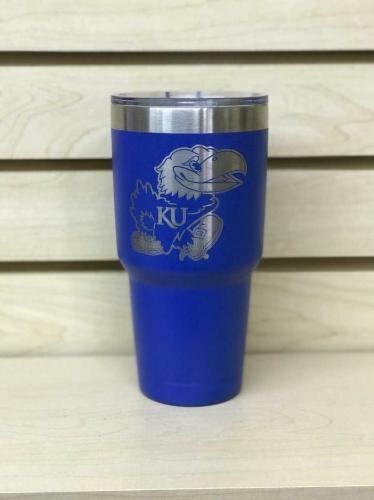 Kansas Jayhawks Stainless Steel Insulated Vacuum Tumbler - 20 oz. or 30 oz. Support your favorite team while keeping your cold drinks cold and your hot drinks hot... for hours!!! Just like name brand tumblers at a fraction of the cost! 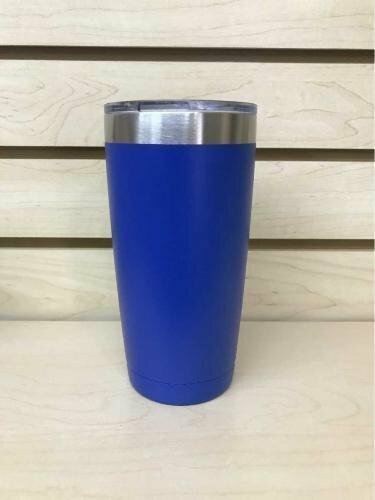 Made with durable kitchen grade stainless steel with a durable powder blue finish. Double wall vacuum insulation to keep your drinks at the desired temperature. Tumbler does not sweat, no need for a coaster! Available in 20 oz. and 30 oz. sizes, engraved or blank. - Wash before first use. - Use only mild dish soap to clean - do not use bleach or abrasive cleaners. - Do not place in freezer. - This is not microwave safe. Do not microwave to prevent fire and personal injury. - Use caution with hot beverages to prevent burns. 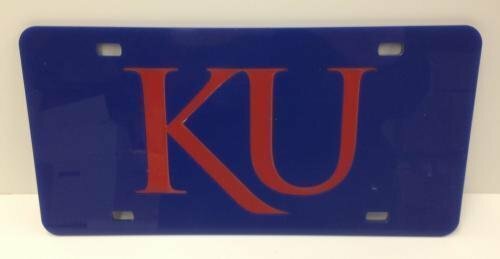 Approximately 2 1/2" decorative car emblem featuring the Kansas Jayhawk. This emlem is made of 1/16" black acrylic with a mirror chrome finish. 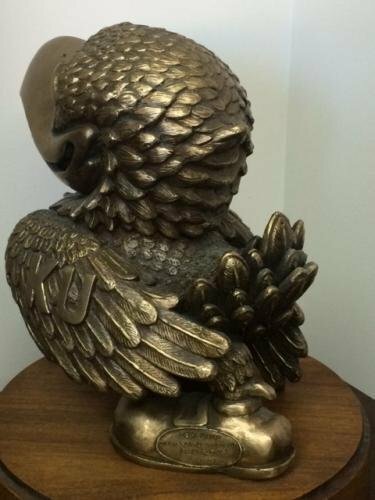 A Jayhawk Trophy original! 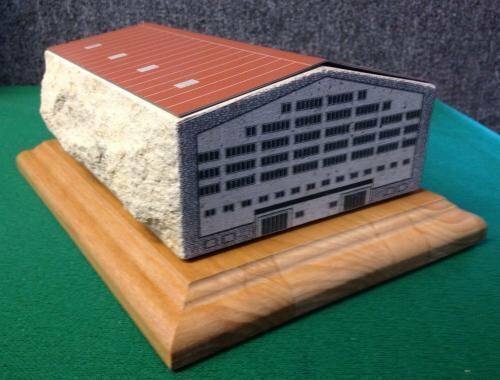 4 1/2" X 6" real limestone scale replica of Allen Fieldhouse on a laser engraved red alder wood base. 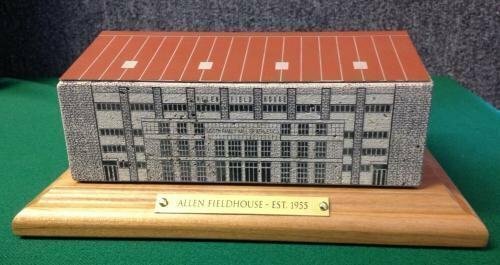 The front and sides of Allen Fieldhouse have been laser engraved with precision detail to replicate the look of this historic building. The back of the limestone has been left "raw" to give the look of a brick used on the building. The roof is closely color matched to the actual rooftop and is made of powder coated steel and laser engraved. 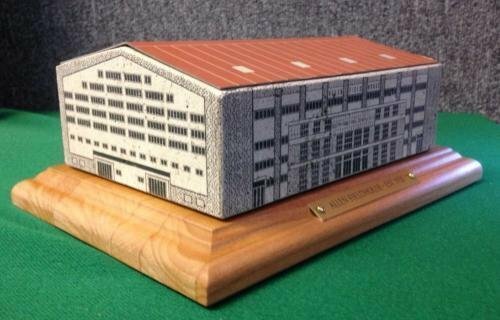 When you move the Allen Fieldhouse replica off of the wood base, you can see a laser engraved replica of James Naismith Court. 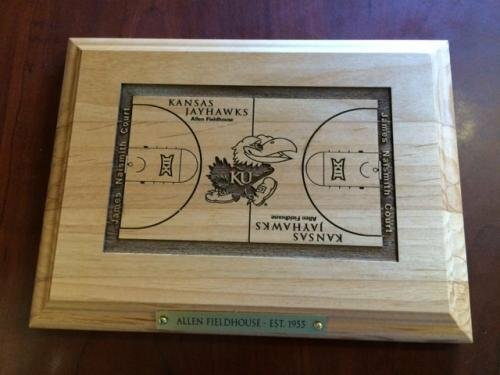 There is also a laser engraved plate on the front of the base that reads "Allen Fieldhouse - Est. 1955". 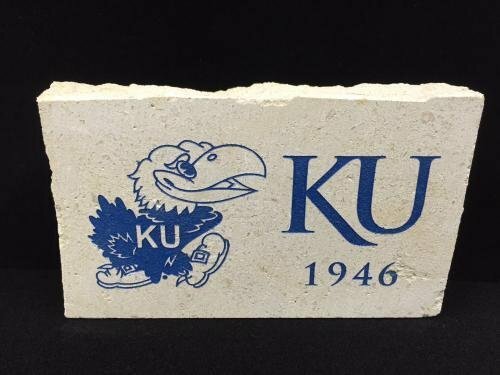 This will be a quality addition to any Jayhawk fans collection. ROCK CHALK JAYHAWK! 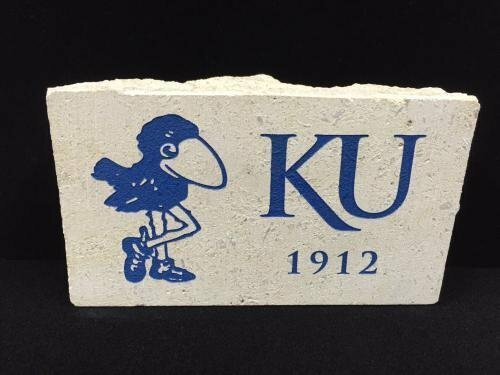 Kansas Jayhawks Classic Limestone Paper Weight - 6 Styles to choose from! 3" x 5" stand up paper weight cut 1" thick from limestone. The sides and top rough cut, leaving "rocky" edges to the limestone. This is available with your choice of 6 different classic Jayhawks, painted in blue. 6" x 12" sturdy acrylic license plate with mounting holes. Blue background with a red acrylic KU inlay. 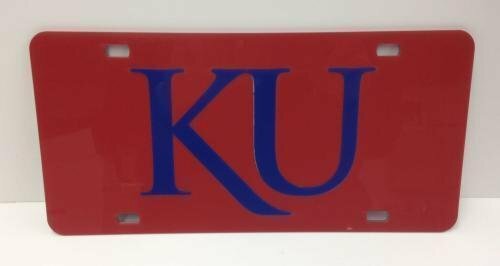 6" x 12" sturdy acrylic license plate with mounting holes. Red background with a blue acrylic KU inlay. 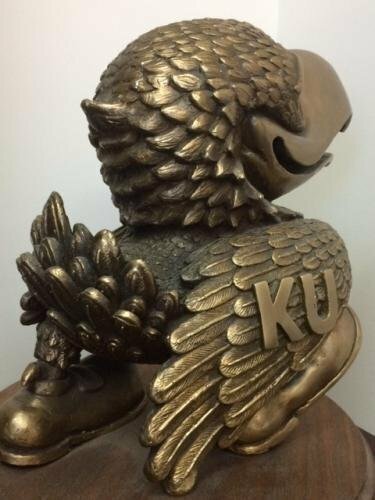 A Jayhawk Trophy exclusive! 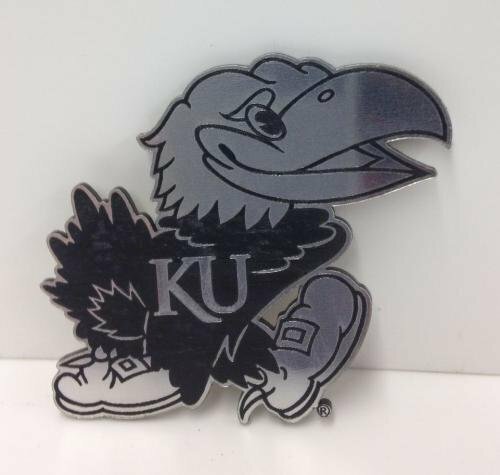 Beautifully crafted 1 1/4" pewter Jayhawk on a nice silver chain with key ring. Overall length 4 3/8". 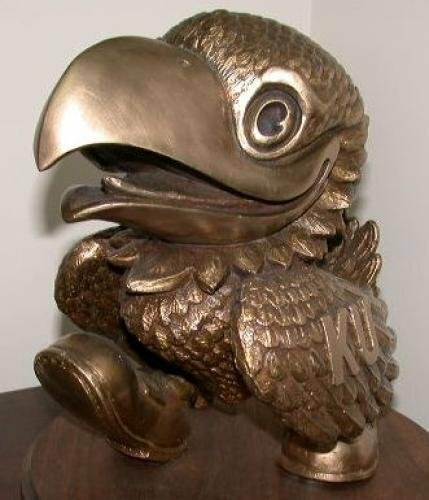 Beautiful 6" tall bronze Jayhawk sculpted by Heidi Meyer. This highly detailed statue comes mounted on a hand rubbed American Walnut base so it can be instantly displayed with your collection. With base, overall height of this beautiful Jayhawk is approximately 8 inches tall. Price includes a brass plate attached to the base with your choice of personaliztion engraved on the plate.